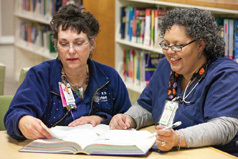 Ascension Seton nurses work hard to advance nursing practice through research, evidence-based practice and dissemination of knowledge. The science of nursing is strengthened through the promotion of research studies and the dissemination of findings that are readily integrated into practice. Take a look at recent nursing annual reports, publications and presentations and RN projects to learn more about leading efforts at Ascension Seton.